History: (What If? 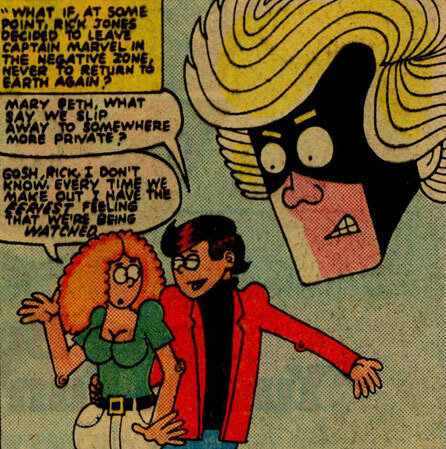 I#34/8) - After Rick Jones decided to leave Captain Marvel in the Negative Zone, he focused more on his personal life, meeting Mary Beth and suggesting they go somewhere more private. Mary Beth seemed hesitant, always feeling like someone was watching them when they made out. This reality diverged when Rick Jones opted to leave Captain Marvel in the Negative Zone.